What is the customs process in Nigeria to import? How is import cargo released from Nigeria Customs to importer? Import cargo clearance in Nigeria Customs. Who are the parties involved in import customs clearance formalities in Nigeria? 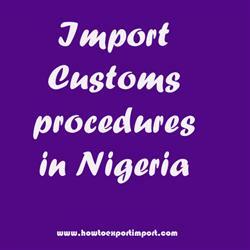 The information provided here details on how to import goods to Nigeria especially import customs clearance procedures in Nigeria. Nigeria Customs Service was saddled with the responsibilities of revenue collection, accounting for same and anti smuggling activities under the supervisory oversight of the Nigerian Ministry of Finance. Once you arranged the necessary documents for import, then open Form M on the Nigerian Trade Platform (Single Window system) attaching the required documents such as insurance certificate, proforma invoice and the product certificate and Submit the listed documents to the ADB (Authorised Dealer Bank).The originals of the documents should be submitted to the processing bank prior to validation. Then the bank validates & processes your Form M, and sends to NCS. The importer should activate SONCAP certificate which is obtained and send by the supplier. Customs will issue a pre-arrival assessment report (PAAR) if they accepted the Form M, which you will use to commence the clearance of your cargo. Customs Declarations can be done through ASYCUDA. Process to import to LAGOS. Requirements of customs to import to APAPA. Customs requirements in Sokoto to import. Customs needed to import to Enuguf. How can I clear customs to import in TINCAN ISLAND. Import customs procedures required in TINCAN ISLAND. Import Customs process in PORT HARCOURT . What Customs formalities required to import in Port Harcourt. What should I do to import goods in Calabar. How to get import customs permission in Asaba, Delta. Procedure to get customs clearance to import in Abuja. Mandatory process need to complete import in PORT HARCOURT The way to get customs clearance process to import in Sokoto. How to export from Haiti? How to Import to Haiti? How to import to India from Haiti? How to export from India to Haiti? What is the GST rate on Mysore painting, Rajasthan painting, Tanjore painting? How to select overseas buyer? How to prepare GST tax Invoice?